For a late dinner we decided to give the Little Mexico Cantina & Tequila Bar a go this evening (31 Wellesley Street, Auckland CBD) and had an excellent meal in a relaxed, but authentic, environment with attentive service. We started with the Salsa Dip Platter which consisted of a fresh salsa, guacamole, salsa verde (we think), sour cream, a light chilli sauce and corn chips. This was packed with flavour and for $10 great value. I then had Beef Enchiladas that were flavoursome and accompanied by refried beans, guacamole, a small salad and salsa and sour cream. Very enjoyable. Jane had a Chicken Burrito that she thoroughly enjoyed. All up it was a well priced casual meal out we thoroughly enjoyed and we will happily return. This is a lovely soft Sauvignon Blanc from Moana Park’s Cover Point Vineyard in the Hawkes Bay that is very easy to drink. The wine is Vegetarian Society Approved and this is something the Vineyard is very proud of. Jane & I visited their vineyard in Jan 2009 where Dan (the winemaker) took us through the wines. It was probably our most memorable friendly wine experience of the trip at a lovely boutique winery with superb wines. The nose has a hint of citrus, and to taste it has lovely citrus zesty characteristics I would usually associate with a Riesling and some Passionfruit flavours coming in the background. 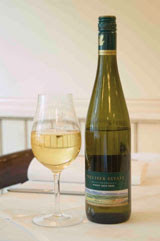 It is a light straw coloured, medium length crisp wine that is nicely balanced and I would happily buy again. Drinking well now and it still feels it has a bit of life in it.